Eight months of breastfeeding my little Miss Ava, hoping to make it one year, but no exact end plan in sight. I’m still a strong believer in FED IS BEST. I have had one of both. My first was mainly bottle fed, my second has been exclusively breastfed with bottles of breast milk when we are apart. Every baby and mama are unique, so feed your baby whichever way works. With that being said, unlike my first born, breastfeeding Ava has come very naturally to us. Although, breastfeeding is a huge time commitment, I am very proud that I am able to provide for Ava in this way, especially since being a busy working mama of two, while also training and running a fall marathon. When I first started my marathon training in July, I was 13 weeks postpartum/post c-section. Because of the summer heat, I became paranoid that I might see a dip in my milk supply, once I started to increase mileage. I had heard stories of women who exercised too much, very suddenly, and just as suddenly they found their milk supply drop. I told myself that my main priority was (is) my baby (babies), and if my milk supply became jeopardized in any way, then I would stop training for the marathon. I began researching breastfeeding and marathon training, but I couldn’t find very much information on this topic. So I reached out to other mother runners on IG and in Mom’s Run This Town running group, to see what other mother runners experienced. I also asked my daughter’s pediatrician who is a certified lactation consultant for advice. This is the knowledge I gained while exploring the topic of Breastfeeding and Marathoning. This is my experience. First thing first – according to my pediatrician and lactation consultant, as long as baby continues to drink milk from the breast, emptying the full breast, my body will make the exact amount of milk that my baby needs. This is true even if one is marathon training. However, the proper nutrition and fueling is very important during marathon training, even more so for a breastfeeding mother runner, such as myself. It is very important to consider hydration and calorie intake, because they are crucial components to making milk. During a twenty mile training run, the body burns close to 2,000 calories and as a breastfeeding mom an additional 500 calories is burned a day. So those calories must be replaced to make milk. Because I stayed hydrated and well fueled, I never saw a dip in my milk supply. I found this true when asking other mother runners from IG and MRTT. Another important factor is taking a prenatal vitamin. A prenatal vitamin is recommended three months before pregnancy, during pregnancy, and while breastfeeding. It will help provide all the necessary vitamins mama and baby need. This is extremely important for breastfeeding mamas who are also marathon training, because these extra vitamins will help prevent injuries. I took my prenatal vitamin all through out my training, and I am continuing to take it, until I stop breastfeeding. As a breastfeeding postpartum mother runner, I am more prone to running injury. There are several reasons why… but the main reason is because of the hormone relaxin. Relaxin is created by the pregnant body to soften and loosen ligaments and joints, so the body will be capable of giving birth. This hormone is still present several months after giving birth, and makes a marathon training mama more prone to injury. Another reason is Calcium and Vitamin D. This is where it is important to take a prenatal vitamins and eat a diet rich in calcium and vitamin D. If the body is not getting the sufficient amount of calcium and vitamin D, it will provide what it has to for baby first, through breastmilk, making mama more prone to stress fractures. And healing from injuries may take longer as well. During marathon training, I personally never experienced any major injuries. I had a sore calf muscle after my first run over ten miles, but rest is all I needed. Regardless if you are breastfeeding or not, always listen to your body, and back off the training when you need to and rest. With that being said, always remember rest days are part of training. Rest and recovery are as important as your long run. If for some reason you do experience a drop in your breast milk supply, know this, breast milk supply can go up, down, and back up. DO NOT WORRY… Stress can make things even worse. Just relax and use these tips to help bring your supply back up. Rest and breastfeed baby- If possible take a day or two of rest, meaning decrease mileage or rest from training entirely and be with baby. If baby is able to breastfeed on demand or you have the opportunity to offer the breast to baby, your body will be able to determine the exact amount of milk your baby needs. Breastfeed baby often. Ideally breastfeed baby every 2-3 hours. Never go more than 5 or 6 hours with out breastfeeding or pumping, especially if you are experiencing a supply drop or low supply. Hydrate- Drink tons of water. If your body is dehydrated it can’t make milk. The more you drink the better. For an extra boost in milk supply, drink Mother’s Milk Tea. Fuel- Make sure you are eating enough calories. But for a boost in milk supply, eat oatmeal. I tried to eat oatmeal regularly during my training, and still love to eat oatmeal, and oat based foods. This definitely helps keep my supply boosted. I buy the organic instant apple cinnamon flavor. It is very fast and easy for me to take on the go. Never ate it before a long run though. Try eating every morning for breakfast especially during a marathon training build up. Other foods I eat are green smoothies enriched with fennel, and soups. Fennel is very good for breastfeeding moms. And smoothies are both calorie and hydration. Soups also do the job because again, soups are both hydration and calories. Pump- If you can’t be with baby to breastfeed or you just want to add additional feedings… get your pump ready. There are a couple different ways you can use your breast pump to increase your supply. One way to increase supply when you find your supply dipped is feed baby on both breasts, and then immediately pump after the feeding for a minimum of 5 minutes on each side. This will insure you empty the breast completely. If milk does not come out while pumping it means your baby successfully emptied the breast, however keep pumping for the addition time, it will trick the body into thinking baby is still there and needs more milk. Another way to increase or bring milk supply up is to pump in between feedings. For example if you are feeding every two hours then pump an hour after breastfeeding baby. Do not play the comparison game. If another mama gets more ounces than you, that’s what her body does. You focus on you, and every drop of milk counts, so take what you can get and store that milk. My experience … I’ve done both of these pumping strategies and they both work on increasing milk supply. However, I have a very consistent pumping schedule for the days I work, and a very consistent breastfeeding schedule for my baby while I’m at home with her. I find the more consistent I am at feeding my baby and pumping the more consistent my milk supply becomes. Schedule 15-20 minutes extra in the morning on race day to either breastfeed or pump. Or if you are traveling a further distance to your race, bring your pump with you, and pump in the car. Whatever decision is made, make sure the breasts are empty before you toe the line. My experience … I ran the Navy Half Marathon and the Marine Corps Marathon, as a postpartum breastfeeding mama. Both times, my baby, Ava, was asleep, before I left for the race… So I pumped. The expressed/pumped milk went right in the bottle and then the refrigerator, that way it was ready for Ava, first thing, once she woke up. This also made it easier on my husband, who also had to get the baby and my three year old dressed and ready to spectate my race. In the early days, when my daughter was a newborn, I breastfeed her on demand. As she became an infant I breastfed ever 2-3 hours, never going longer than 3 hours. Now that she is taking on solid foods, I normally breastfeed every 3 hours offering her solid foods at least 3 times a day. I normally offer milk first and then food. When I’m at work, my pump schedule mimics my breastfeeding schedule. I do not have a huge breastmilk stash in my freezer. I normally pump exactly what she will need for the next day. My goal is to be consistent and on schedule, that way my body is never guessing. When I ran my half marathon, I had no problem. I pumped in the morning right before the race. I ran a 2:10 half marathon, and then got home right after to breastfeed Ava. It was probably 4 hours between feedings, which is totally fine. However, I was a little worried after my full marathon. I pumped in the morning. Then I ran my marathon in 4:44:21. Although, I tried to get to Ava as fast as I could. If you add up the time before and after the race, it was probably 6 hours between feedings, maybe a little longer. Of course my husband fed her bottles ofbreast milk and solid foods while I was gone, so she was content with a full belly. It was more about me needing to empty the breast. Because I don’t run marathons everyday, and there normally is not a 6 hour gap between feedings, it didn’t effect my supply in anyway. One day out of the norm isn’t going to be a problem. Plus Ava was seven months old, and my milk supply was well established plus, never took a dip during training. Although, I didn’t take advantage of the tents, because my husband brought my baby to me as soon as he could. I was very impressed with the Marine Corps Marathon this year, for having nursing tents at the finish line. This was a huge help for breastfeeding mamas who ran the marathon and either needed to breastfeed baby right after the race, or had to pump immediately after. I managed to successfully continue to breastfeed and marathon train. I managed being a mother of two small children while also making time for one of my life passions, running. It’s incredible what the female body can do, and I’m so very proud of mine. One day, when I was heading out the door for a run, my three year old begged me not to go. She said, “Don’t go running, mommy!” Normally, she comes with me in the double Bob running stroller. But that day for some reason she didn’t want to go, and she didn’t want me going either. “Because Mommy, made a commitment. When you make a commitment, you have to stick with it. I signed up for a race, and paid money to participate in it. I set a goal, that I need to achieve. I’m committed. I then told her she could come with me or stay home with daddy, but I was going running and would be right back. One of my biggest hopes is that one day, my little ones will find something they are truly passionate about, and that they will understand the importance of living a healthy lifestyle. I have little eyes watching my every move, my ultimate goal is to set the best example I absolutely can. So that is all that I experienced as a breastfeeding marathon. If you have an question please contact me. I want to shout out a special thanks to the Marine Corps Marathon. You put on a great race yet again. And thank you Marines, for supporting Breastfeeding marathon mamas! To most woman, Fashion is important, and even more so for a mama to be. For us, pregnant ladies, we want to have a stylish bump. However, it becomes difficult to find clothing, when every day our bodies change, growing bigger and bigger. Earlier this week, I introduced you to one of my favorite maternity clothing brands, Ingrid & Isabel. Today, it is all about my other favorite – STORQ! STORQ is all about the basics. They only have a couple main pieces, which include – a skirt, leggings, dress, and tank top. But that is pretty much all you need. On their website, they provide videos showing different ways you can use these four pieces by pairing them with accessories you may already have. All of the products come in only two options, black and white, however this summer the dress came in a couple different colors. They have bundles, which is a more affordable way to get a couple items, all at once. These bundles also make a great gift, if you have a friend or family member who is newly pregnant. It has always been a challenge for me, to find clothes that are both stylish and comfortable. Well STORQ does both. This is really important when you are pregnant, because unfortunately pregnancy is not always comfortable. When it comes to clothing, I first received the white tank top as a gift. I loved it so much that I then purchased both the black tank top and the black leggings. I have been living in these three pieces, pairing them with a denim vest or boots. The leggings are the softest pants I own. They also have some beauty products. I fell in love with the lipstick and Belly products. The lipstick is an organic, bright red/orange color, called Wild Child. 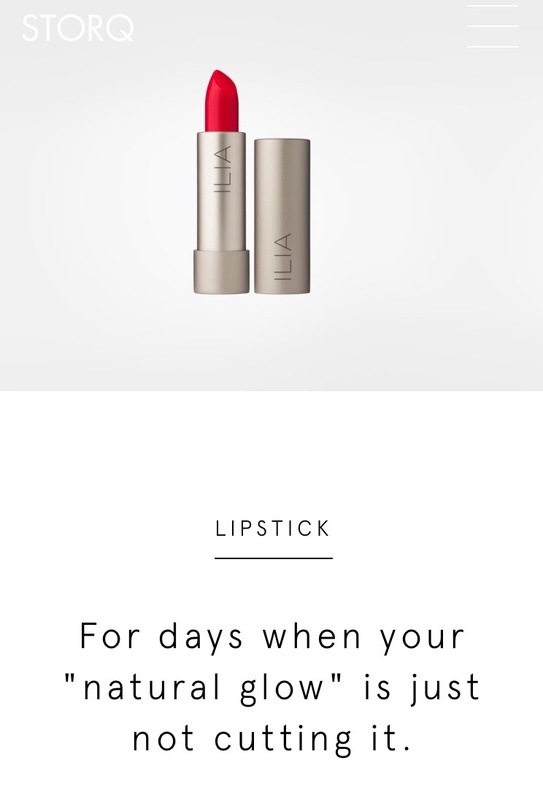 It feels good on your lips and brightens up your whole face. 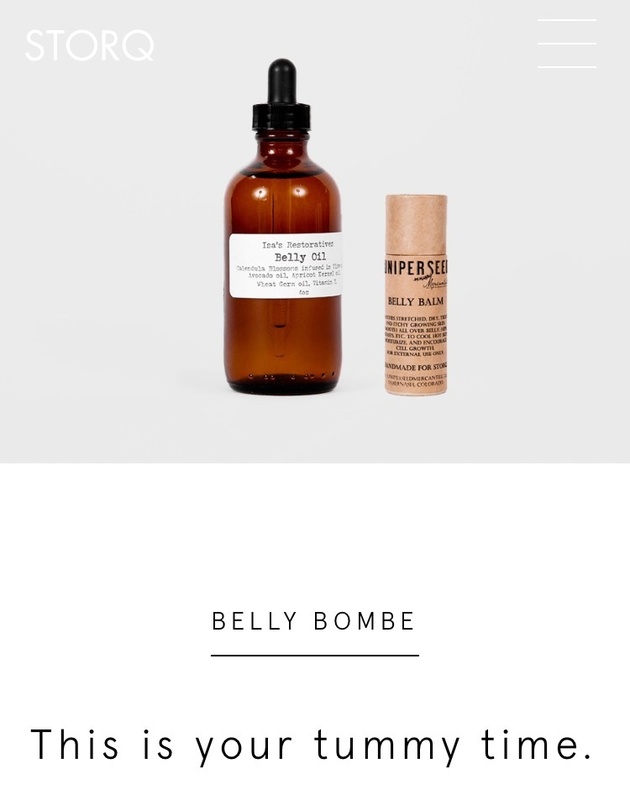 When it comes to the belly products, I have both the belly bombe and belly oil. During the winter I made my own body butter, but I like to switch things up, and once I got my hands on this belly combo, I fell in love. It is important to take care of your belly, to avoid stretch marks. So far I haven’t had one stretch mark. The belly balm and belly oil are both soothing and hydrating. Now that my baby is coming in 2 weeks, I am on the hunt for the best nursing bras. Well guess what? STORQ just came out with intimates. Because none of STORQ’s products have ever disappointed me, I went for the bundle. These pieces arrived in a quick 2 days. Again, the fabric they use is so extremely soft. There is one more item, that I have purchased, but because of popularity, I am still waiting for it to arrive. I am waiting for is the Carryall bag, aka baby bag. 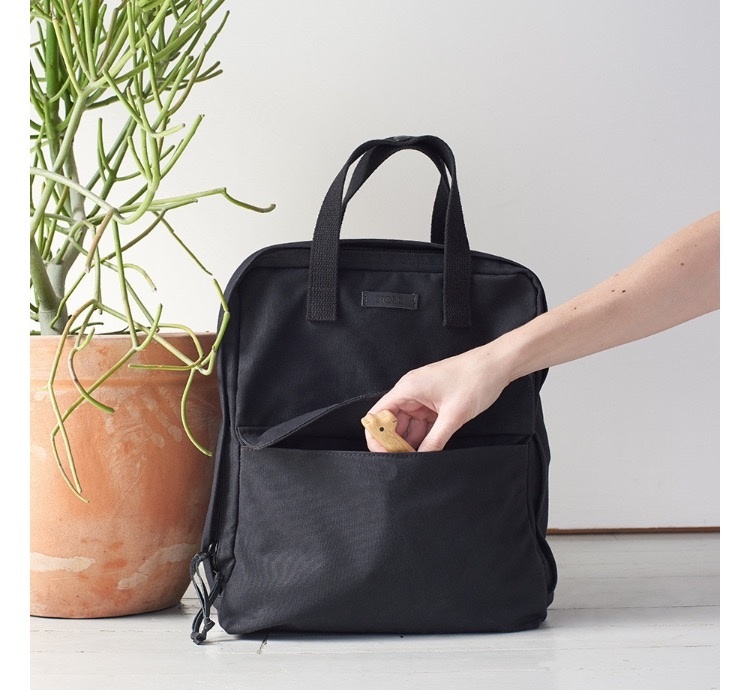 I wasn’t going to get a baby bag, I was just going to use my lululemon bag, but when STORQ came out with this bag a month ago, I had to have it. I can’t wait for it to arrive in early August. STORQ has the softest, most comfortable, basic maternity clothing. If you want a stylish bump, STORQ is the way to go. Have you tried STORQ? What is your favorite STORQ item?